robb315 - Brian Enos's Forums... Maku mozo! Luxottica owns both Oakley and LensCrafters. I get my prescription from my own optometrist and take it to LensCrafters and have them order the OakleyRx lenses from Oakley. I have a couple sets of prescription Oakley lenses. They’re actual prescription lenses from Oakley. Not inserts. Prizm trail lenses for shooting outdoors and clear for indoors. I run the Flak Jacket frames. You can get CR Speed pouches pretty low if you flip the hanger over on the belt so the pouch attachmennt insert is at the bottom. Max commented that it’s the same as the current Romeo 3/RTS footprint. Dead serious. Rip it off fast and hard. Rip them off like a band-aid. It’s the only way. They build and have built many models that aren’t marketed toward competition shooters and don’t really have a place in competition shooting. Costa Carry Comp and that Tactical with the threaded barrel currently in the lineup. Not to mention all those tactical carry guns they made. (Hex Tac, DVC Carry) STI has made some very interesting decisions over the past few years to say the least. They had ss that were ss legal but they felt it necessary to get rid of the 1911 line for some reason. 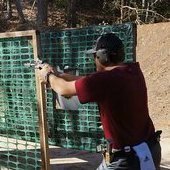 So since open and carry optics falls on different days, yet they are still under the match title of Hicap Nationals, can you not shoot both for score? C-more VS RTS2 OR SIMILAR? Ahh. Misread your post. thought it said Ver. 3. Anyways, mine uses them up quick and there are a few others that I know of that also go through batteries very quickly. Between that and the diodes letting loose, I'm in a love hate relationship with mine. That’s why, the V4 gobbles up batteries quick. I have to change batteries quite frequently on my V4 RTS also. Unless you live in a restricted state, I don’t see why this would be worth the trouble and possible malfunctions it may cause. The 10 round mags are relatively inexpensive. Had Dan build this shorty for me last winter. Love the steel grip on it. Surprisingly makes same power factor as my full size Bedell with same powder drop. I went from a full size to a shorty. Like the way it feels to me a lot better. I was at 4.2grs with a Precision Delta 124jhp averageing 131pf. 1.090” oal.